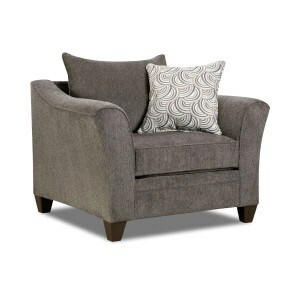 Showcasing transitional design, this beautiful chair makes a wonderful addition to your living room space. Featuring flare tapered arms, the chair includes a cushioned seat and pillow back for extended comfort and support. Completed with tapered legs, this elegant chair fits well in most modern living room settings. The 6485 Transitional Chair with Flare Tapered Arms by Simmons Upholstery at Royal Furniture in the Memphis, Nashville, Jackson, Birmingham area. Product availability may vary. Contact us for the most current availability on this product.